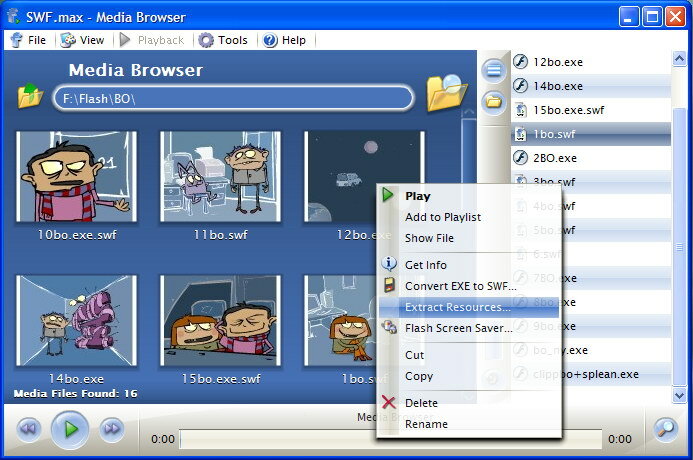 Play Adobe Flash Player compatible content like games, movies or animations and Control Playback like if these were ordinary videos. Browse and organize your SWF Movies using a built-in Media Browser. Thumbnails make it easier. Play or demonstrate your SWF Movies in Full Screen mode. Play any kind of compatible file types like SWF movies, EXE projectors and FLV Videos. Set your SWF movies as a Screen Saver or Interactive Animated Wallpaper. Convert SWF Movies to EXE Projectors and vice versa. Projectors created are smaller than ordinary ones! Generate thumbnails for your Web Site using SWF Thumbnail Generator with XML export. View detailed Features Description and Screen Shots. Or have a look at the Awards. Download Free Player and have fun watching SWF Movies! Updated with Adobe Flash Player 24 compatibility. Thumbnail Generator can optionally embed PNG watermark images to SWF Thumbnails now. Thumbnail Generator can generate thumbnails for single .swf files as well as for folders. Updated with the latest Adobe Flash Player 10 compatibility. Previous versions of SWF.max will not work. Compatible with the latest Adobe Flash Player 9. New scripting automation commands: OpenMovie and ClearPlaylist. FLV Video playback. Organize Folders. Export info about movies into a single XML file. Extended movie information. Additional browsing capabilities. New options to add swf movie to your Desktop, Repeat and Shuffle options. A brand new skin exactly fits your system color preferences. Now supports Adobe Flash Player 8. SWF.max is able now to partially Extract Resources from SWF files (so called swf decompiler). This version can extract JPEG and MP3 files from SWF movies. 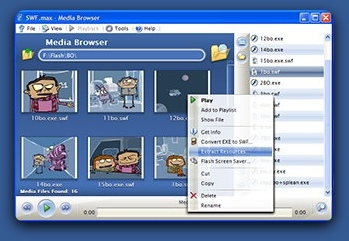 New version features Playlists, File Management and improved user interface.